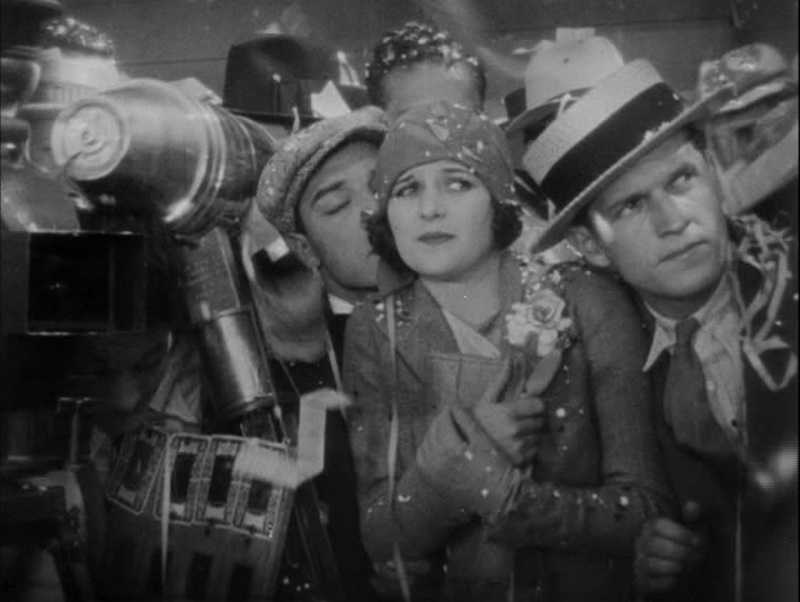 I’m pleased to update this post to announce the 2019 San Francisco Silent Film Festival kicks off this year on Wednesday, May 1, with a 7:00 pm screening of Buster Keaton’s 1928 comedy triumph The Cameraman, in a beautiful new restoration undertaken by the Criterion Collection, Warner Bros. and Fondazione Cineteca di Bologna, and accompanied by Timothy Brock conducting an ensemble of students from the San Francisco Conservatory of Music performing his original score. The 2019 SFSFF Award for commitment to the preservation of silent cinema will be presented to Gina Luca Farinelli on behalf of the Cineteca di Bologna before the screening. Set in New York, but filmed mostly in Hollywood, The Cameraman was Keaton’s last silent feature production, and his first film for his new studio MGM. 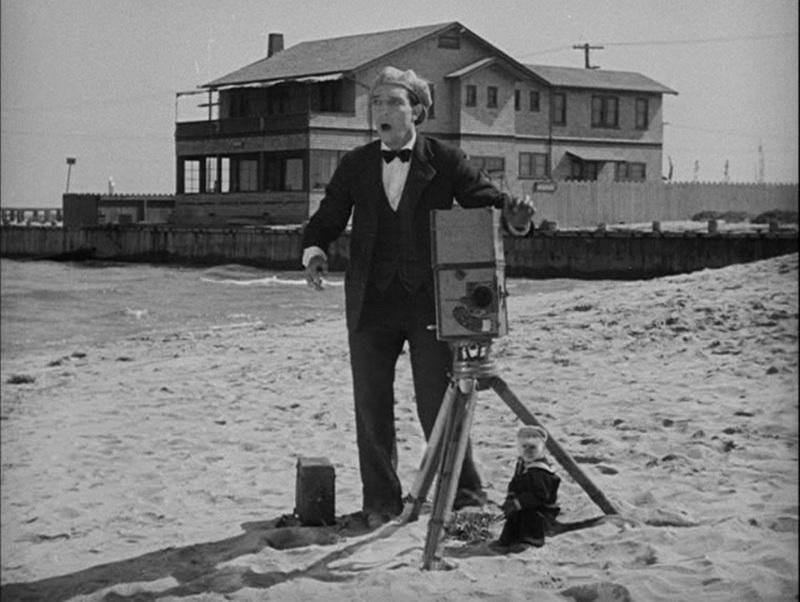 Buster plays a tintype photographer, selling portraits on the sidewalk, who longs to become a newsreel cameraman in order to impress Sally (played by Marceline Day), a receptionist for the Hearst Newsreel Company. While I cover the New York and Hollywood locations more extensively in my Keaton book Silent Echoes, here below are a few fun discoveries. (Note: for Manhattan fans, other recent posts reveal the setting of Marceline’s New York apartment appearing in the film at 20 W 58th St, and Buster running beside the newly-opened Bergdorf-Goodman department store, both seen HERE, and the setting for Buster’s New York apartment at 201 E 52nd St, revealed HERE). Early in the film, Buster leaps aboard a moving fire truck at the iconic intersection of Hollywood and Vine, with the stately Taft Building standing in the background. 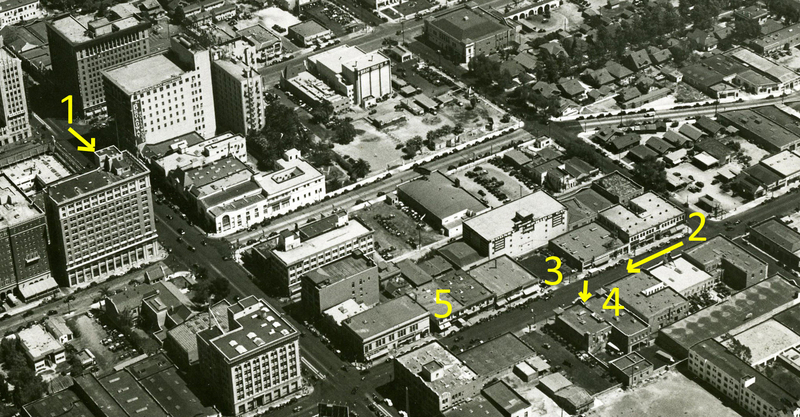 This circa 1934 aerial view of Hollywood (below) shows the path (arrow) of Keaton’s fire truck at Hollywood and Vine (1), and later its path as it travels north up Cahuenga towards Hollywood Boulevard (2), before turning left into the former Hollywood fire station (4). The parking lot across from the fire station (3) is where Buster stows his pet cow Brown Eyes during his feature comedy Go West (1925), and the Chaplin-Keaton-Lloyd alley up the street (5) is where a passing car whisks Buster away one-handed during Cops (1922). (1) Hollywood and Vine; (2) up Cahuenga; (3) the Go West parking lot; (4) the fire station interior; (5) the Cops alleyway, part of the Chaplin-Keaton-Lloyd alley. You can download a PDF tour explaining more than a dozen silent movies filmed on Cahuenga Boulevard in Hollywood here Hollywood’s Silent Echoes Cahuenga Tour 2018. Jumping to New York, when Sally calls Buster to tell him her plans have changed, and she is free to see him, Buster dashes up 5th Avenue from W 55th Street, and arrives at her apartment before she can hang up the phone. Later, Buster and Sally stroll along the same block. During one of the few scenes filmed on location in New York, Buster races north up 5th Avenue from the corner of W 55th Street. To the far right stands the 5th Avenue Presbyterian Church. The spires in the center right background, my original clue to identifying this scene, belong to St. Patrick’s Cathedral, the 11th largest church in the world. In the modern view below the spires are blocked by glass skyscrapers. This stretch of 5th Ave also appears in W.C. Fields’ It’s The Old Army Game (1926), and in Harold Lloyd’s Speedy (1928) – read more HERE. As mentioned, other posts reveal Madeline’s New York apartment, and Buster’s New York apartment. The Venice Plunge interior, as it appears during the film. 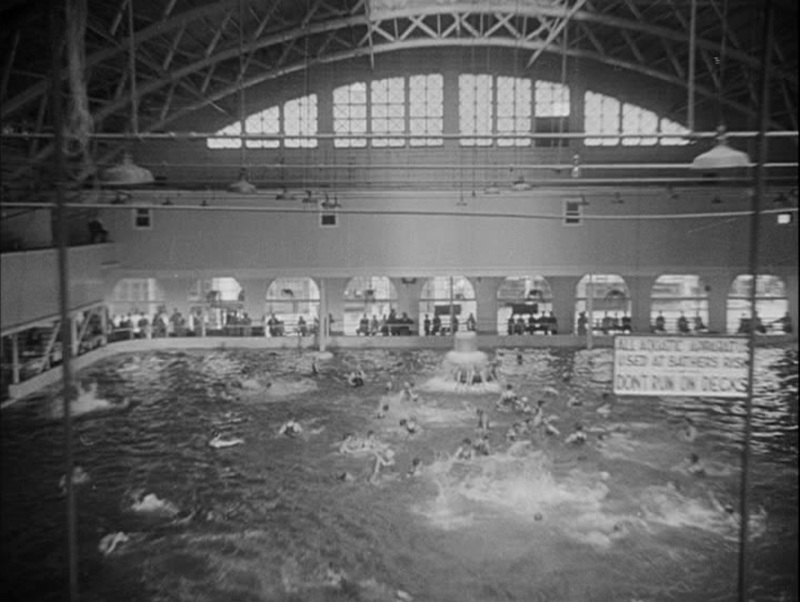 Another notable location appearing in The Cameraman is the Venice Plunge (now lost), the large indoor swimming pool located beside the former Abbot Kinney Pier, where Buster and Sally go on a date. Charlie Chaplin filmed beside the Venice Plunge in 1915 for his short comedy By The Sea. Buster beside the extant home at 2234 Channel Road in Newport Beach. The conclusion of The Cameraman was filmed in Newport Beach in Orange County. The extant Newport Beach Pavilion appears in one early shot. 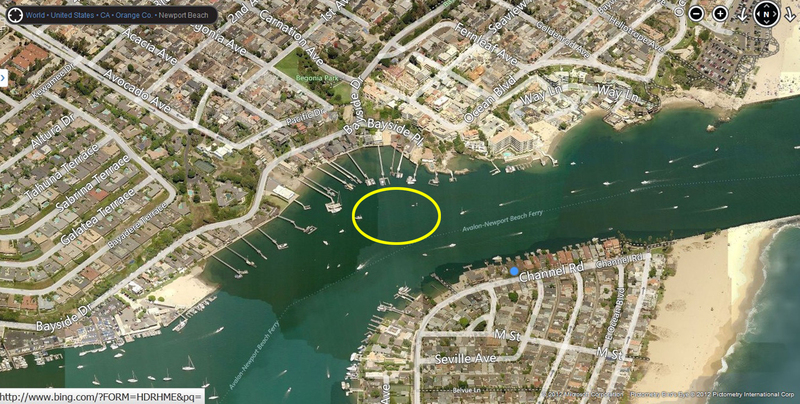 The boat race was staged near the south end of Newport Bay. The oval in this aerial view below shows where the speed boat runs in a circle. The blue dot below show where Buster captures the speed boat on camera, standing before the extant home at 2234 Channel Road, appearing behind Buster during the scenes (at left). Buster stood near the blue dot above, filming across the channel towards Bayside Drive, as the speed boat races in a circle (oval above). (C) 2012 Microsoft Corporation, Pictometry Bird’s Eye (c) 2012 Pictometry International Corp. The Cameraman images (C) 1928 Turner Entertainment Co. This entry was posted in Buster Keaton, Manhattan, The Cameraman and tagged Buster Keaton, Manhattan, Silent Comedies, Silent Movie Locations, Silent Movies, The Cameraman, then and now, Venice. Bookmark the permalink. I just watched this film on TCM and was, as usual, curious as to where the outdoor scenes were shot. 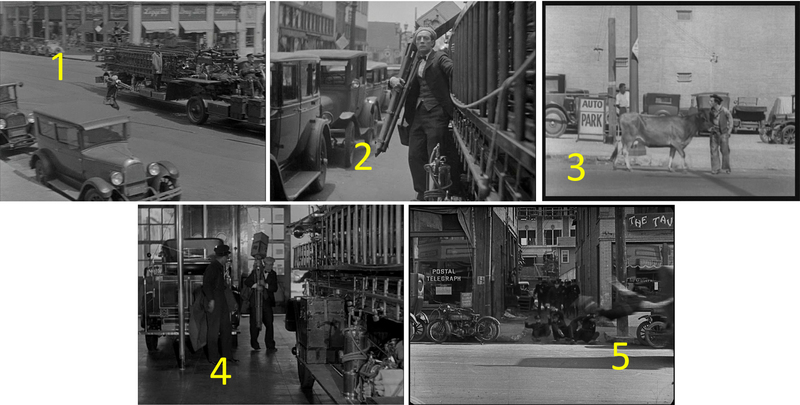 Once again I found my answers from “Chaplin-Keaton-Lloyd film locations (and more).” Some scenes indeed looked more like NYC than LA, and the ocean/beach scenes appeared to me to be in SoCal; turns out that both are true. This is one thing I really enjoy about watching old films, seeing landscapes before they were over exploited. The house featured in the article stands seemingly alone on a sandy island in the film. Today the place is unrecognizable. Houses are jammed together along the whole beach, and sand is not even visible. Thanks Chris – the TCM broadcast print looked clean and sharp – maybe someday they’ll release it on Blu-ray.